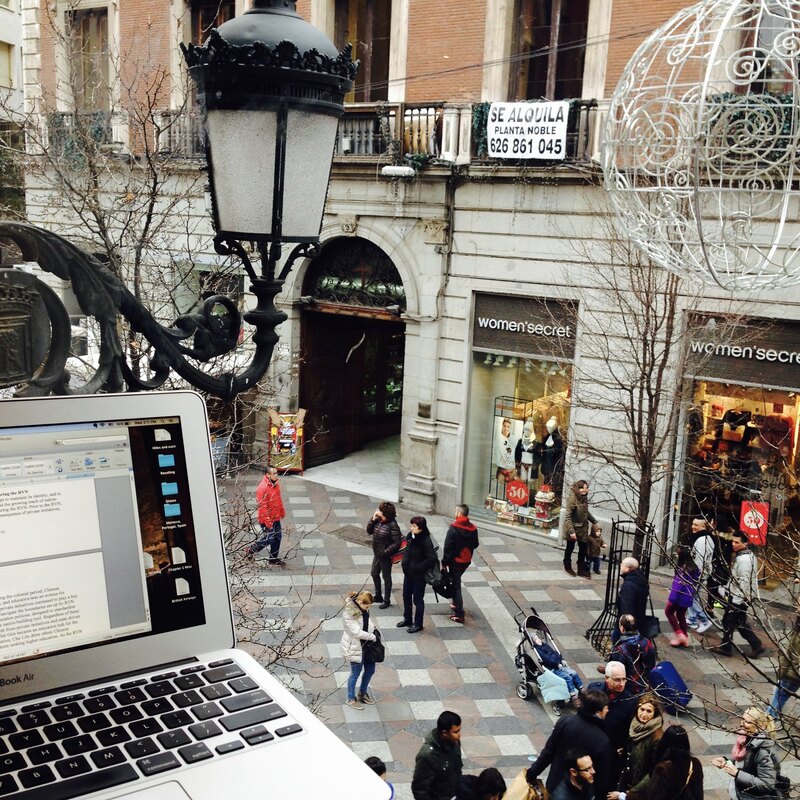 Ah, my one and only day in Madrid. Initially, I had planned to get a day metro pass to ride the metro around and see more sights, but sometimes, one can know a city more intimately on foot. 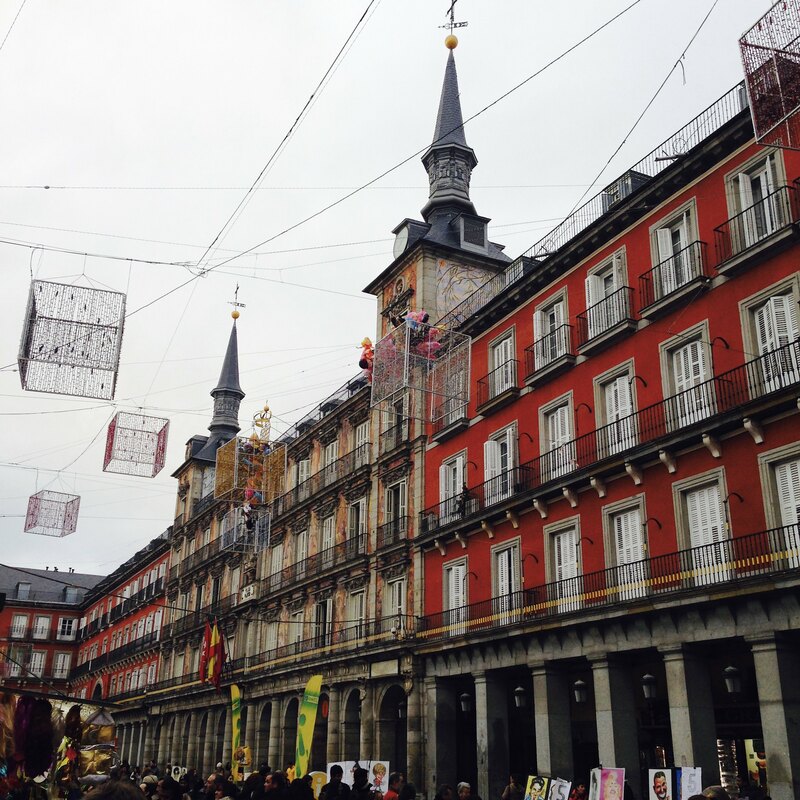 So, I decided to walk from my hotel in Argulles to Gran Via, and Puerta del Sol. It has been some six years since I was last visited a European city (Athens, maybe?). 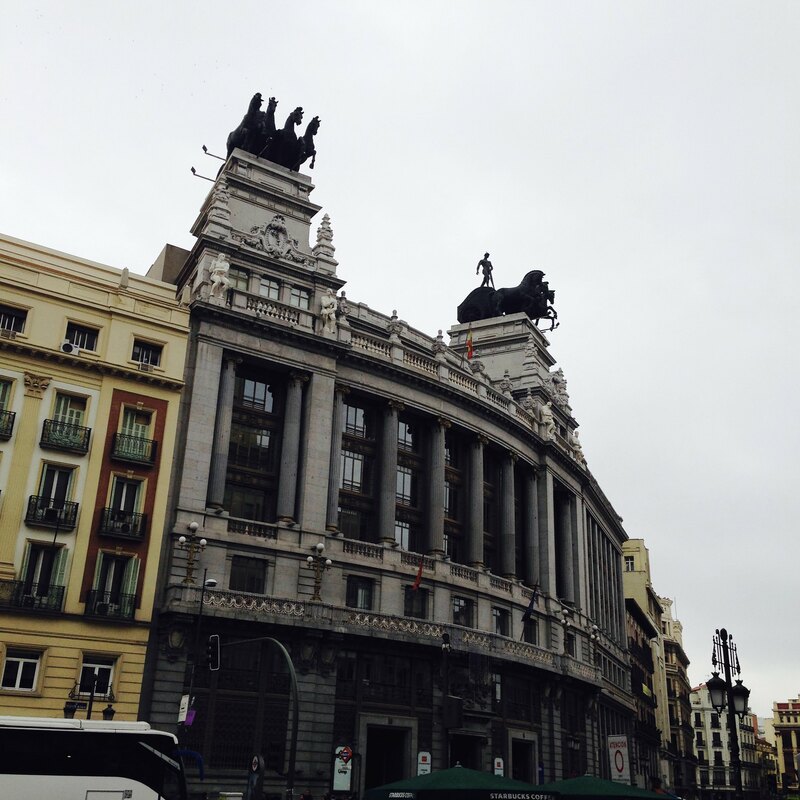 As I walked down Gran Via, and wandered around the tourist-popular streets and plazas, I marveled at the chariots, and statues perched atop these grand buildings. 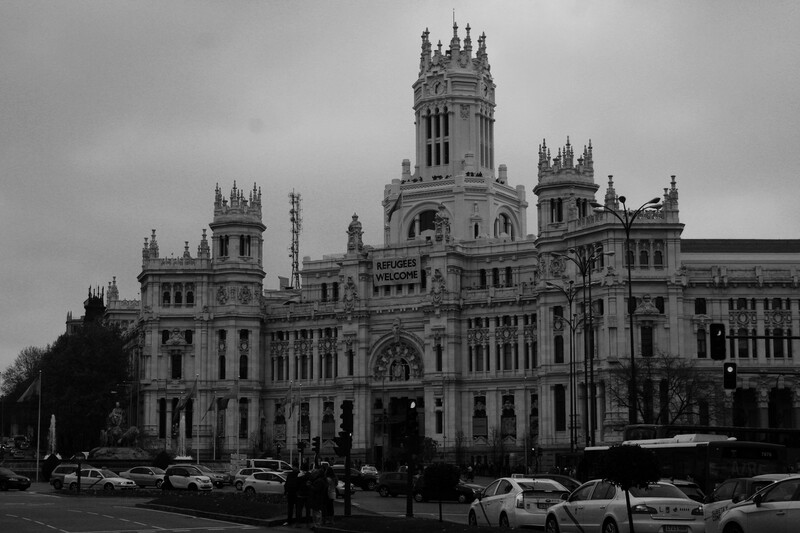 The end point of my aimless wandering led me to very elegant Palacio Cibeles. While its ornate architecture was a visual stunner, the thing that truly caught my attention, was a banner hung across it: “Refugees Welcome”. 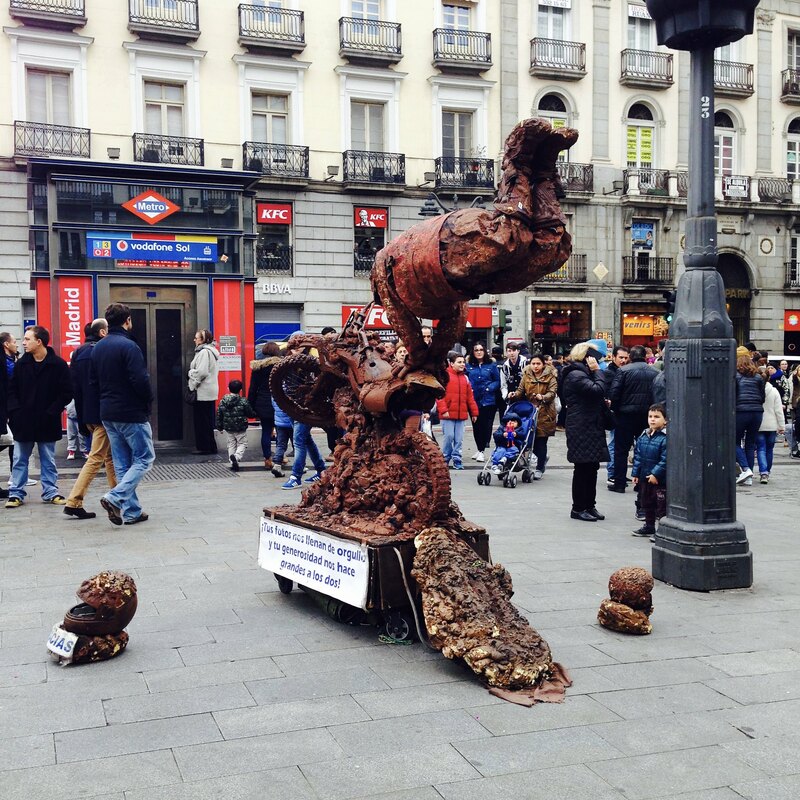 The area around Puerta del Sol is also quite interesting, even if it’s not quite my scene. I think I enjoyed looking at the Christmas/New Year light fixtures hung on the streets above, but the plaza itself was too crowded. I think it’s really the love child of Times Square and Disneyland, thankfully without the high entrance fee of the latter. 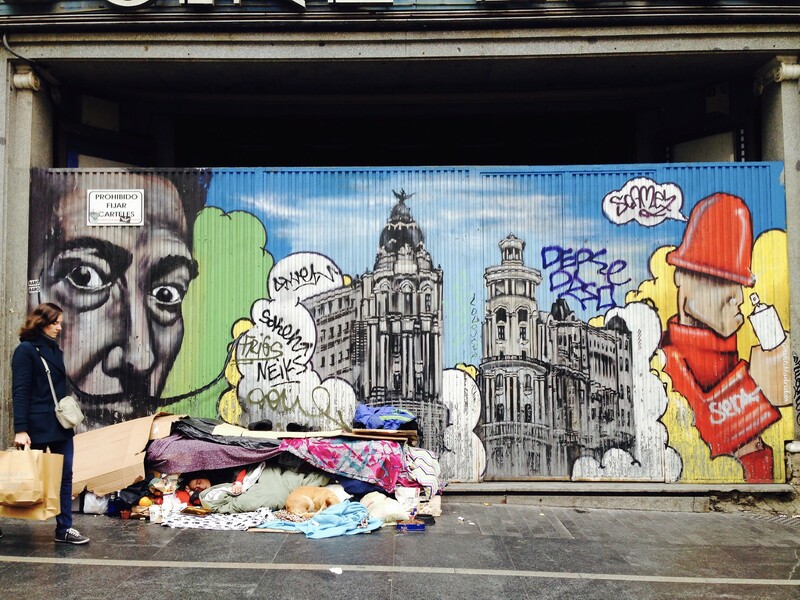 There are a lot of street artists on Arenal street feeding into Puerta del Sol. If anyone wants to enlighten me about how some of these street artists seem to levitate, please do leave a comment! While I really wanted to spend more time wandering, and also visiting some art museums, by the mid-afternoon, I decided I had to get some work done. I wound up at a Starbucks (argh! ), which is actually located on prime people-watching real estate. Located on Arenal street, it is a bi-level, and on the upper level, you can get some great views of the street, if you can score a window seat. 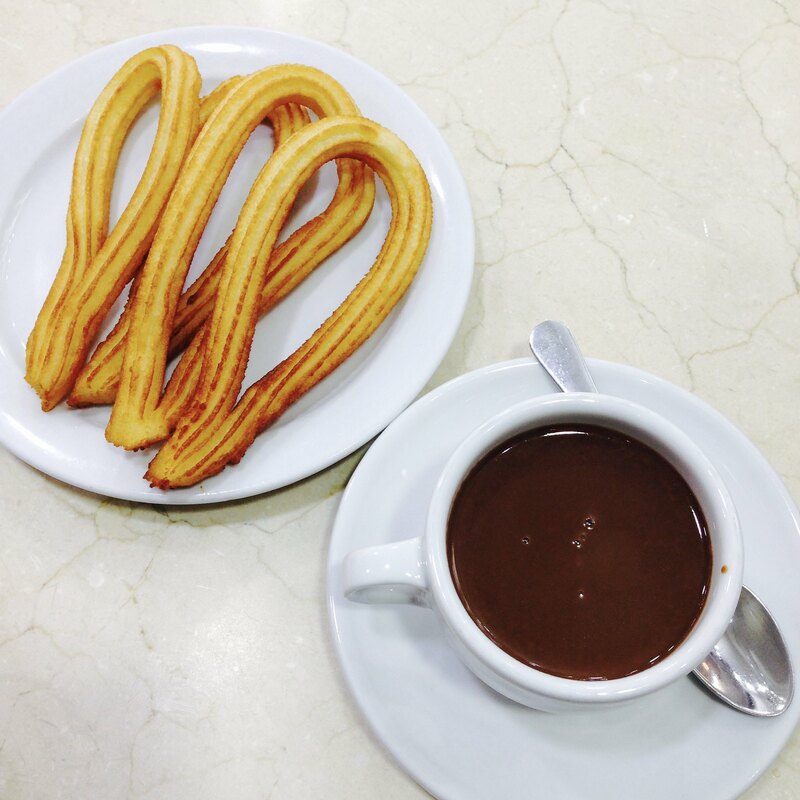 After a couple of hours of work, I decided to backtrack, and go to a chocolate shop for some churros and dipping chocolate (4 EUR). I wound up going to 1902, mostly because I was lazy. The churros were nicely fried, the dipping chocolate was pretty decent, but the service wasn’t exactly friendly. To walk off some of the chocolate, I decided to wander some more. Initially, I thought I had seen everything. 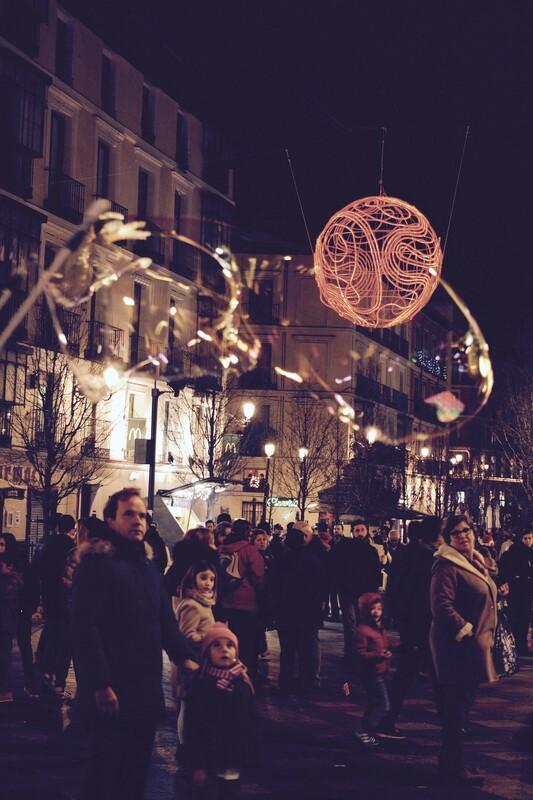 But when I wound up at Plaza Real, it was worth the extra little trek. The square is very magnificent, and reminiscent of other European grand squares. For some reason or other, Brussels comes to mind. It is enclosed, and they had a different set of light fixtures. They also had a Christmas market going on, but it wasn’t too interesting for me. As it was just the late afternoon by this point, I decided to go to another café to get in another couple of hours of work. 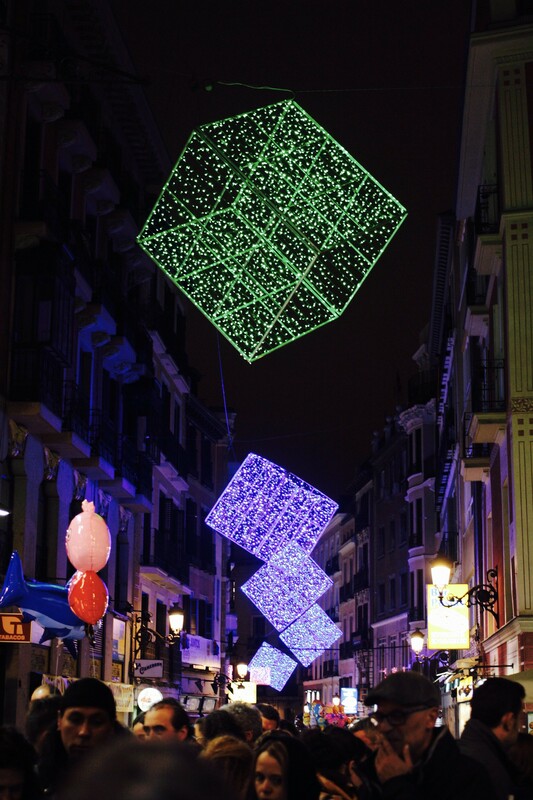 After seeing all the different light fixtures in Madrid, I was very excited for nightfall, and to see how the city will be lighted up. It certainly didn’t disappoint. I retraced all my steps earlier in the day, to hit some of the more interesting spots. It was truly a lovely walk. 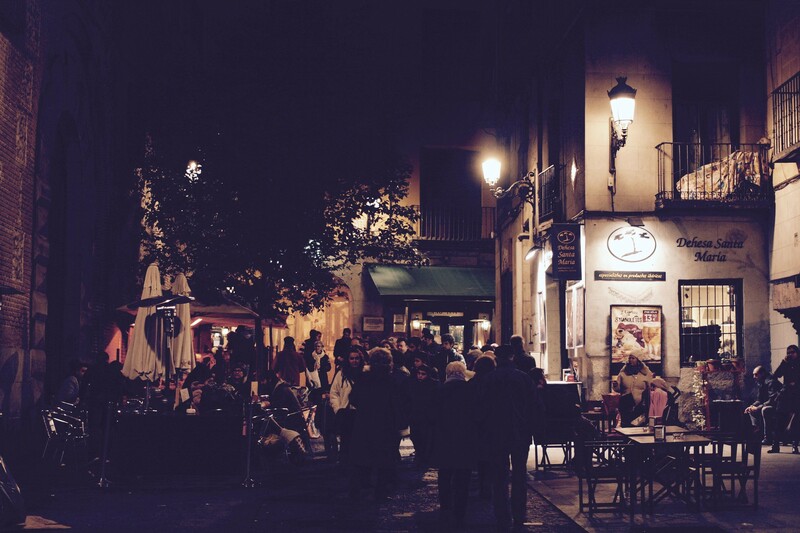 I’ll let the pictures do the talking, but it certainly reminds me why I love wandering around cities so much. 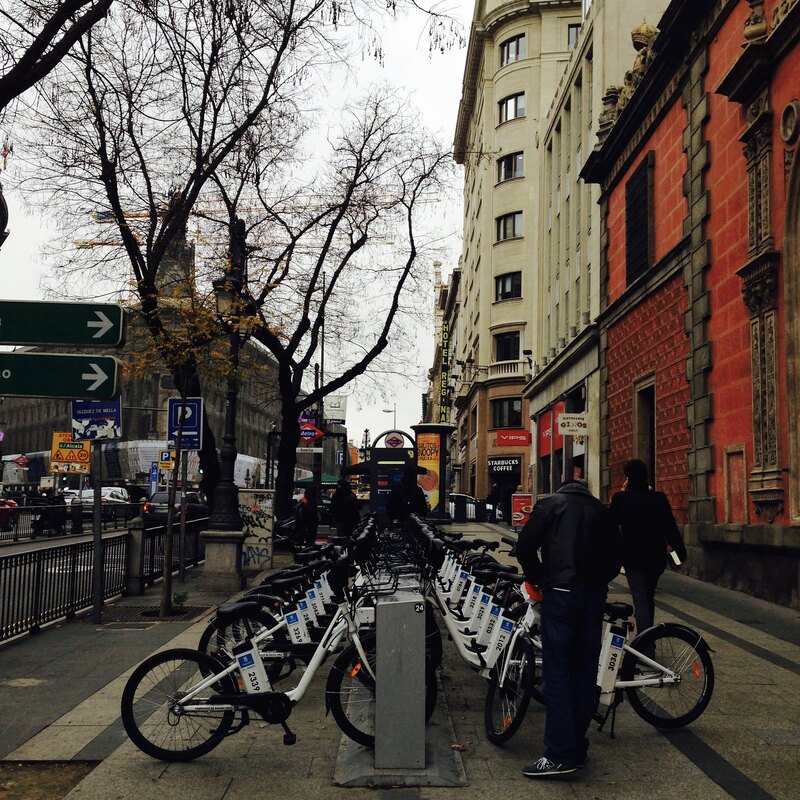 Madrid does have a bike share system. I went to check it out, but it wasn’t exactly clear how much a day pass costs. It didn’t seem possible to find out that information without filling out a rather extensive, personal information screen. Also, they don’t provide helmets, and coming from a city that has a helmet law, and fresh from a couple of falls in the past month, I was a little skittish about renting a bike to see the sites more efficiently. Having said that, their annual pass for 25 EUR (if I understood the system correctly) seems way cheaper than my annual pass for ~80 USD.